Nayax, a cashless payment service provider, has been nominated for a Vending Star award in the "auxiliary material for the operation of the vending machine" category for its contactless reader Onyx. The event will be held at the Euvend and Coffeena exhibition in Cologne, Germany. Following this selection by Euvend and Coffeena jury panel, Onyx will be on display in hall nine of the Cologne Exhibition Centre, in the Vending Star Area. Visitors to Euvend will also be able to see Onyx on Nayax’s stand, B031. 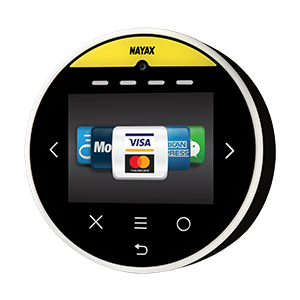 Onyx has a sleek, compact, eye-catching design, a colour touchscreen and fits on any unattended, automated machine. Onyx accepts a wide range of payments, including contactless smart cards, NFC and mobile payment apps, standard and dynamic QR codes, including WeChat Pay and Alipay, and prepaid cards. With the trend towards cashless transactions, Onyx provides excellent benefits to vending operators, increasing revenue and productivity. With LED lighting to grab consumers’ attention, Onyx has an intuitive user interface, for easy navigation, letting consumers choose their screen language. The product’s integrated telemetry allows operators to easily manage and monitor their business with Nayax’s management suite. This lets them monitor their vending machines’ operations in real time, allowing operators to track sales, machine data, cash accountability, inventory reports, alerts and more, in real time.